When asked by her mother if she’d ever marry, Charlotte von Mahlsdorf answered that she didn’t need to. She was and would always be her own wife. Von Mahlsdorf’s response to her mother can in part be explained by her decision to live as a woman. Born male as Lothar Berfelde in 1928, she adopted the names Lottchen and eventually Charlotta during her teenage years in Berlin when she began to wear skirts and dresses. It is as Charlotta that she became renowned throughout Germany as an avid furniture collector and an important figure in underground social circles, especially during the Cold War. The details of Charlotta’s singular life come to light in The Jungle Theater’s remarkable production of I Am My Own Wife by playwright Doug Wright, who met Charlotta during a visit to her museum of Gründerzeit era (1871-1918) furniture in the 1990s, and became obsessed with stories of her life and work. By recording conversations with Carlotta and scouring archives for documents about her, Wright creates a play that captures the care she took to salvage such items as chairs, wardrobes, and phonographs. She made space in her museum for these pieces that would otherwise have been destroyed in the many wars and repressive regimes that mark German history of the twentieth century. She also opened her museum to homosexuals and artists who during the 1960s and 70s were not able to openly congregate in bars and other meeting places. Nurturing both people and objects, Charlotta emerges in Wright’s account as not only her own wife, but also as a kind of caregiver to those forgotten, cast-out, or ignored by the rules and regulations of the present. Bradley Greenwald vividly brings Charlotta’s persona and story to the Jungle’s stage. To write that he fully inhabits this character would be something of an understatement. Greenwald plays not only Charlotta but also more than 30 other characters, including her father and aunt, Stasi officers and prison guards, politicians and journalists, and even a version of Doug Wright himself. Greenwald switches between these characters with ease, and is thoroughly convincing as each and every one. He effectively alters the tenor, speed, and cadence of his voice to signal these shifts in character, and it’s to his and voice coach Lucina Holshue’s credit that these characters remain distinct, even as they are in dialogue. Changes in Greenwald’s posture, as well as subtle alterations to the set, lights, and sounds, further punctuate shifts between characters. Choices made by director and set designer Joel Sass, as well as by lighting designer Barry Browning and sound designers Sean Healey and C. Andrew Mayer come together beautifully to illustrate that one-person shows are not really the work of just one person. Their collaboration with Greenwald reveals how even the smallest of gestures and flickers of light can produce arresting effects. 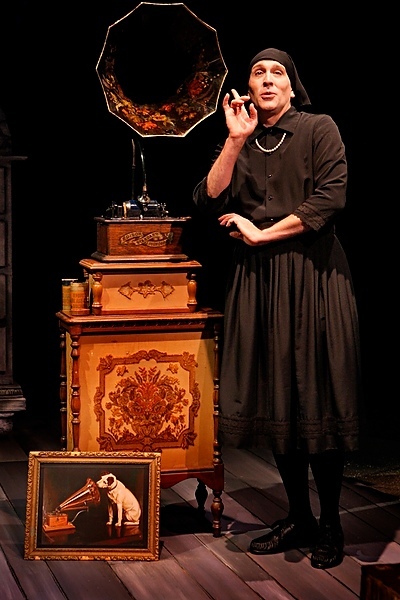 In a production filled with such small and effective shifts, it’s notable that Greenwald rarely changes costume, but usually remains in the self-imposed uniform that Charlotta adopted later in life: sturdy black shoes, a collared black dress, and a string of white pearls. The decision to mostly keep Greenwald in this black-and-white clothing (designed by Amelia Cheever) is not only efficient, preventing countless changes for which there just isn’t time, but also makes artistic sense given the fact that it is Charlotta’s story which serves as a prism that refracts the supporting characters’ entrances and exits. The fact that such these constant entrances and exists work, enhancing Charlotta’s story rather than muddling it, is due in no small part to Wright’s script. Filled with phrases that are deceptively clear and simple, the script manages uncannily to convey exactly the impressions one has of Charlotta and her interlocutors, even as these impressions become increasingly conflicted. There are only a couple of moments that feel too on-the-nose and straightforward for this otherwise nuanced script. It’s hard to tell where Wright’s script ends and Greenwald’s performance begins, just as it’s hard to tell how much of Charlotta’s persona is true and how much is contrived. Such ambiguities as these underscore why I Am My Own Wife represents theater at its best: By blending together text, performance, set, and subject, it creates an experience that is more than the sum of its parts.